DESCRIPTION: Sunset Ridge offers a spectacular view of the mountains and valleys of Acadia. 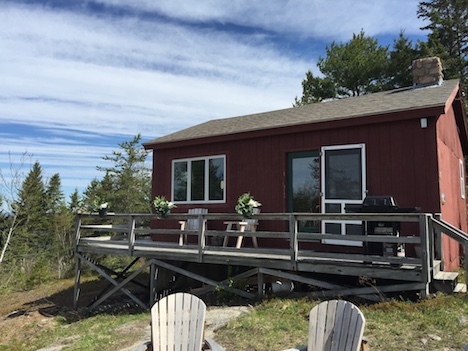 The well-appointed, cozy cabin sits high atop Stone Haven Drive in rural Bar Harbor. Adjacent to Acadia National Park lands, it's situated on 22 forested acres with a handful of other cabins in a private subdivision. Acadia's famed Carriage Roads are less than a mile away, and the bustling and picturesque Bar Harbor village is less than four miles. 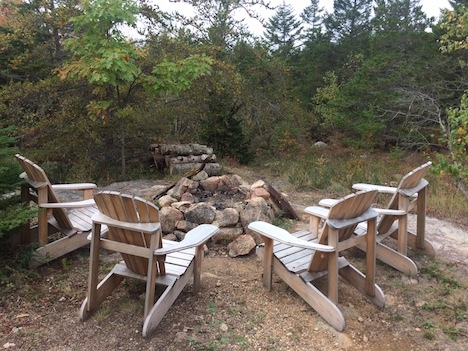 Enjoy morning coffee and blueberry muffins from your Adirondack chairs on the wrap-around deck and watch as the mist rises over McFarland Hill and the distant mountains. In the evening relax after a day of exploration of land and sea as you sit by the fire pit and watch one of our spectacular sunsets. Marvel, too, at the clarity and depth of our brilliant night sky. LAYOUT: Enter the open concept cabin from the deck. The living room boasts comfortable leather seating and a wood burning fireplace. The adjacent kitchen is tidy and complete, with seating for four. Two bedrooms, one with a queen bed and another set with twin beds, flank a small center bathroom. Note: This bath has a shower only, no tub. Nightly rentals available - 3 night minimum.